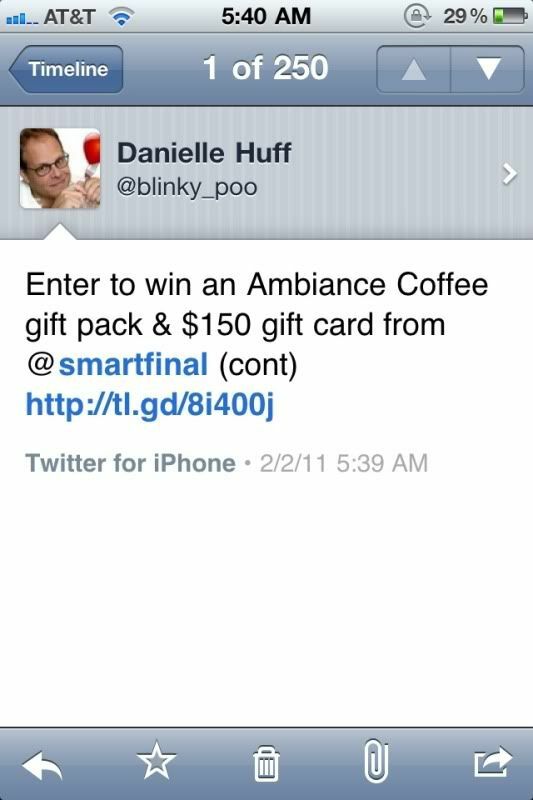 Smart and Final Ambiance Coffee Giveaway!!!! Look at all this coffee goodness! Over the holidays I received a generous basket of coffee from Smart and Final to celebrate the launch of their new Ambiance coffees! With the chaos of the Christmas season is was great to have a treat just for me! I got 6 different types: French Roast, Hazelnut, French Vanilla, Kona Style, Gourmet Supreme, House Blend. My personal favorites were the Hazelnut and the French Vanilla! They were very good and are the perfect base for a coffee treat in the morning. I think my favorite was to have the hazelnut coffee was with creamer and a squirt of peppermint whipped cream. It was so warming and delightful! And don’t judge me;). While it is a very fancy drink, it is still better for you than what you get at Starbucks. Plus it is only a fraction of the price! While that is all good, how about I get to the giveaway? 1 winner will win a gorgeous basket that is just like the one I received. But there is something even better….that 1 winner will also win a $150 GIFTCARD TO SMART AND FINAL!!!!!! Yes, I am yelling but this is big news! I can get a lot of food for the NerdFamily with $150! I am sure that you are wondering what you have to do to enter this fantabulous giveaway. Well, it is pretty easy. Just make sure that you enter quickly because the giveaway closes February 8, 2011 at Midnight pst. Mandatory Entry: Now you must do this in order to be entered at all! Just tell me about your favorite coffee moment! Extra Entries: This is such an awesome giveaway that I am sure you would like more ways to enter. Make sure you leave an extra comment for each entry. Like my Facebook page and share this post with your friends! Make sure you share the post!!! Follow me on Twitter and tweet about this giveaway! 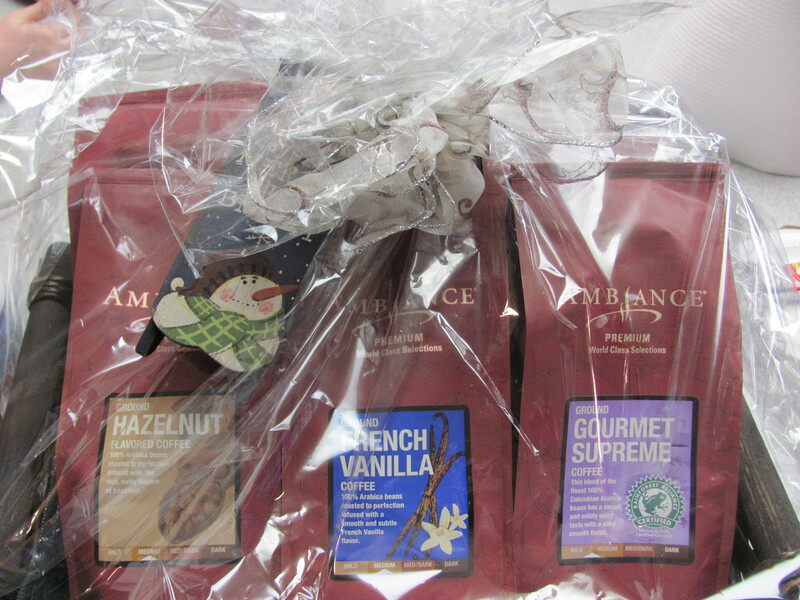 (“Enter to win an Ambiance Coffee gift pack & $150 gift card from @smartfinal (http://www.nerdfamily.com/2011/01/smart-and-final-ambiance-coffee-giveaway.html) #MyAmbianceMoment Pls RT!”) You can tweet once a day! Post about this giveaway and leave the link in your comment! Every moment with coffee is a good coffee moment!!! The first cup of coffee in the morning is the best but if I am enjoying it on a wonderful fall day sitting on a porch looking at the mountains that is perfect. Unfortuantely I live in Florida and that doesn’t happen often. Let’s see, everyday is my favorite coffee moment! I love coffee, drink it every day and drink too much of it. I love latte’s and coffee (no sugar added). I love the way it smells and tastes. I love it hot, I love it cold. What can I say, I am a coffeeaholic! Tweeted the giveaway and I follow you on Twitter. My favorite coffee moment is the 3pm coffee break. It is the perfect pick me up! My 3 year old Micah loves to share a cup of coffee with me. As long as it’s decaf I don’t mind him starting out so young. We will sit at the table in the morning, each of us with a coffee cup and spoon (to Micah the spoon is the most important part) and drink our coffee and talk about whatever comes to mind. It’s our special time together and we both treasure these mornings. He will tell anyone who asks that he likes coffee and he likes his talks with Mommy. I guess in our household, coffee keeps my relationship with my son strong! Coffee and kids…who could ask for more. I never thought about it as my favorite coffee moment, but it would be that first cup of fresh brewed coffee in the morning. I’m oping this isn’t a duplicate comment, I didn’t see my comment. My favorite coffee moment is a great cup of decaf (I’m Bfing) with lots of cream and sugar and a handmade afghan to warm me up. Thanks for the chance! I also liked you on Facebook. Glad to have found you! My favorite coffee moment is the first delicious cup every single morning – it’s my reward just for getting out of bed. Then I have another cup after that, and a latte in the afternoon. Thanks so much for the chance. I’ll be doing cartwheels if I win this! Every morning, my first cup of coffee is my favorite coffee moment! My favorite coffee moment is on the first crisp Autumn morning, sitting out on my porch swing & watching the sun come up.. I liked your fb page & shared on mine. My favorite coffee moment is every morning!! I love waking up to the smell of my coffee brewing, thank goodness for the pre-set option!! Liked you on facebook (kelly doubleyou) and shared this giveaway on my wall. My favorite coffee moment is anytime that I can actually brew my coffee and then sit down and enjoy it without having to either run out the door or get on my computer to work. In fact I love sitting with it while just thinking about nothing and just enjoy the taste and scent as I love coffee!! Liked your page and shared this post with my friends. My favorite coffee moments are every morning when I have the first sip of the sweet ambrosia that is coffee. SO sweet, so warm. I start work really early in the morning and I love that quiet hour in the office over a cup of coffee, before everyone else barges in! my husband makes my coffee for me every morning, and when we have time, brings it to me in bed! a great husband, and a wonderful way to start the day! Early in the morning, while the house is quiet and everyone is still asleep, is my favorite coffee moment. I don’t know how to add the exact link?? After the kids are in bed, the dishes are done, and it becomes ME time — that’s my moment. My favorite coffee moment is in the evening when I get home from work, I sit and enjoy the news with my nice warm cup of joe. Tweeted on Friday, Feb. 4! the best coffee moment is when your chores are done and you put on fuzzy slippers and can relax and savor thr flavor! My favorite coffee moment is Saturday mornings. That is when my husband and I get up early to make a fabulous pot of coffee and then spend the morning relaxing with coffee in bed and chat about the week. We don’t do coffee during the week so this is really a treat. Plus with the buzz of the week with work and all that is our time to enjoy each other. My favorite coffee moment is the first cup in the morning. It starts my day off right. I like you on Facebook (kelly blackwell) and I shared your giveaway via facebook. My favorite coffee break is if we stop at the coffee shop (rare!) and my husband watches our children in the shop while I wander the shops nearby. I liked you facebook, and shared your site and this post! My favorite coffee moment was stopping by my grandma’s house every afternoon and having coffee with her while we chit-chatted. I liked your facebook page and shared this post on my wall (Rust Hawk). Thanks! Hi, Great Giveaway. I would have to say my favorite coffee moment is when I open a fresh package or can of coffee. I love that burst of aroma. I drink a lot of coffee so fortunately I get to experience that moment frequently. On the down side, so does my checkbook. I’d love to win coffee! First thing in the morning! It’s my quiet moment. My favorite coffee moment is when my boyfriend makes me coffee on the weekend and we spend the morning relaxing on the couch. My first cup of coffee in the morning all the time! A bakset to share with all my friends ! I love my cup of coffee every morning, but my favorite times are while on vacation somewhere that I can sit outside and see a beautiful view while I read a book and drink my coffee. I like you on FB and shared. On the weekend, I love having a cup of coffee in the morning with my husband when all the kids are playing nicely together…it doesn’t happen often enough. My favorite coffee moment is that first cup of coffee after both Boyfriend and The Little One are out of the house! My favorite coffee moment is watching everyone drink it while reading a good book! My favorite coffee moment is actually in the afternoon when both kids are down for their naps. I sip some coffee, sit on the couch and relax with a good book! My favorite coffee moment is when I met my husband at a coffee shop for the first time almost 4 years ago!